Stake, Charles Louis (1854-1886), in 1873, he was a student residing at Old (School District) No. 16, Centre Street, Dayton, Montgomery County, Ohio; from 1875 -1877: 16 Maple Street, between Perry and Wilkinson Streets, Dayton, Ohio; from 1878-1880: 24 Maple Street, Dayton, Ohio; From November 1880 : 223 South Jefferson Street, Dayton, Ohio. He was a small time coin dealer from 1875-1886, who specialized in Early American Copper. He was born the only son of two immigrants to America, Louis Stake (c.1829/32-1920), a French émigré and his German born wife Barbara Stake (1835-1901). Charles was very frail and suffered from various medical complications and was a cripple early in life. Yet he established himself as a lesser-known and obscure coin dealer with sporadic ads in Numisma. He published a coin catalogue, monthly fixed price lists, and small mail bid auctions that averaged about 200 lots each. His largest known mail bid auction was Sale #1. August 15, 1882, 230 lots. Fig. 1. 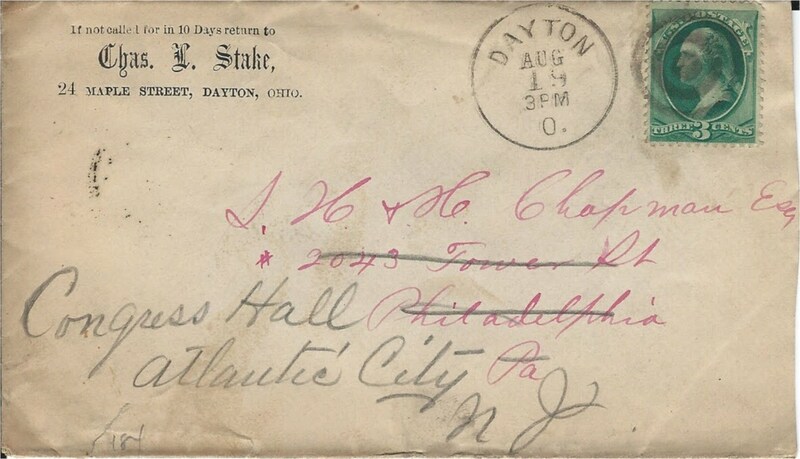 An extremely rare and possibly unique very early Charles L. Stake business correspondence with the Chapman Brothers postmarked June 12, 1879, Dayton, Ohio. Note the hour of day is above the date (very rare) in the dial. The mail clerk switched the position of the slugs for the date and time by error that day. The Duplex and Killer, a negative "J" is not listed in James M. Cole, Cancellations & Killers of the Bank Note Era 1870-1894. 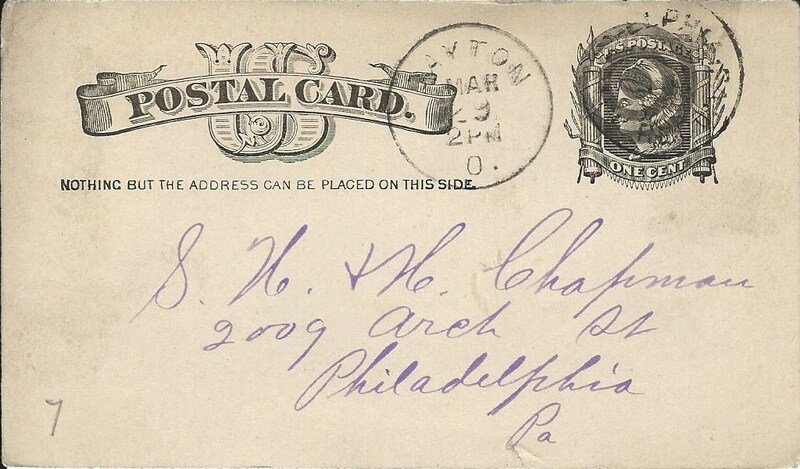 This cover is listed by Richard Frajola in his PhilaMercury as Cover#12722 to illustrate a Scott#147 tied by a fancy cancel on an illustrated cover http://www.philamercury.com/covers.php?id=12722). Courtest Lupia Numismatic Library, Special Collection, The Chapman Family Correspondence Archive. Ex-Andy Lustig $200. Fig. 2. Charles L. Stake business correspondence with the Chapman Brothers postmarked August 14, 1879, Dayton, Ohio. NOTE the postmark dial is modified and contains the hour of day below the date noted here at 3 PM. 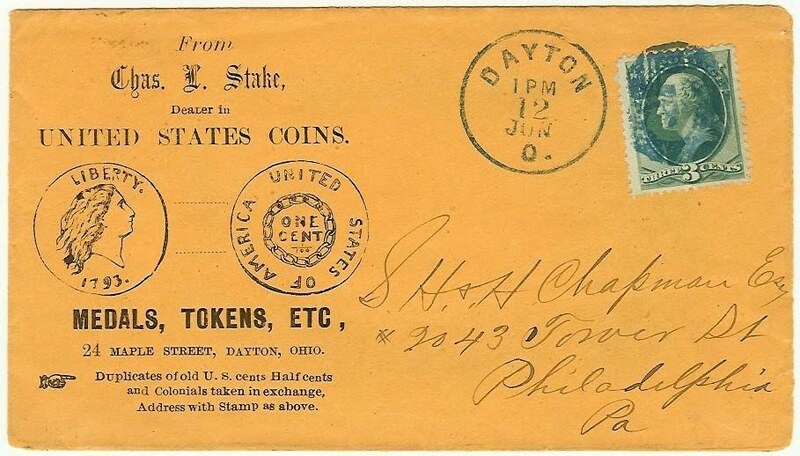 This Duplex with date, hour, and target killer first appears on other Charles Stake correspondence dated August 29, 1878 in the Lupia Numismatic Library. The regular date and time on the bottom (TOB) of the dials at Dayton first appeared in January 1875. The Duplex Cancellation Killer is a negative "X". When he first began he had graphic illustrated letterhead and business envelopes with a hand drawing of a 1793 S.4, B.5 Chain Cent (period after date) for his numismatic advertising printed on cadmium yellow deep as well as tan colored paper stock. He was coetaneous and a true contemporary of the Chapman brothers who began dealing nearly three years before they began dealing independently from Col. John W. Haseltine. We first learn of his coin dealership in 1875 in the Dayton City Directory. 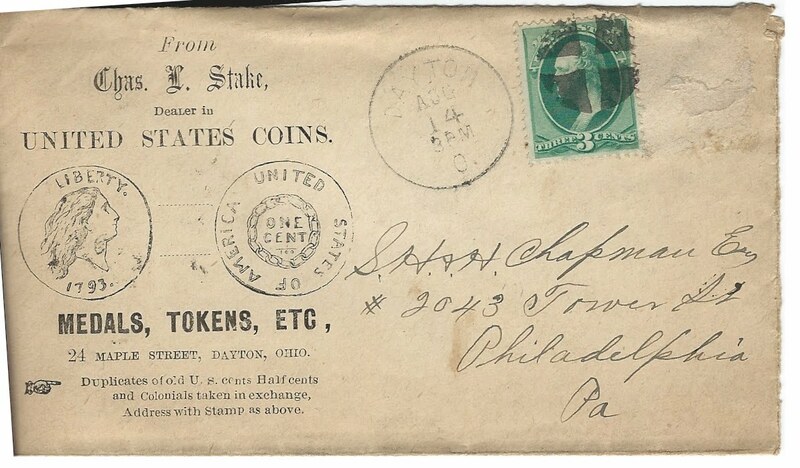 However, this listing did not last but that single year and we do not see him again as a coin dealer until 1878 when he began correspondence with the Chapman Brothers. Seven months later he published an ad in Numisma citing “a neat 16 page pamphlet” Catalogue of United States Coins, etc., for 15 cents beginning in March. (See Remy Bourne, FPL, Vol. 1). At that time he also advertised to his mailing list clients that he would bid for them at coin auction sales for a nominal fee of 10 per cent. His stock comprised of better specimens culled from change of common and scarce United States coinage as well as Colonial coins. He specialized in United States Large Cents, but also sold half cents, medals, tokens, books and electrotypes. Two years later in March 1881 he advertised in Numisma offering his monthly revised coin list for free providing the subscriber mailed him 12 cents to cover the year’s postage. In the May 1882 issue of Numisma,Frossard cites his "Revised Coin list for April". Considering the postage rate compared to the subscription rate for his Monthly Fixed Price List (MFPL), he evidently published the list on a one cent postal card. In the following year he changed the monthly revised list into a monthly coin auction which was typically printed in four pages, with few exceptions in two or three pages. Fig. 3. Charles L. Stake business correspondence with the Chapman Brothers postmarked August 19, 1880, Dayton, Ohio. Note target killer in the Duplex cancelling stamp. N.B. that the post office redirected the mail to where the Chapman Brothers were staying near R. B. Leeds in Atlantic City, New Jersey, a well-known customer and consignor. Also note the change in hand or penmanship by Stake leaving us to wonder if he had an assistant, perhaps his elder sister Mary or one of his parents. Fig. 4. Charles L. Stake business correspondence with the Chapman Brothers. Scott UX#7 PC2 black, buff (1881); Duplex postmarked March 29, 1883, 2 PM, Dayton, Ohio, with a target killer. Stake sending one of his typical animated letters to the Chapman Brothers with a vehement complaint about being cheated. We learn of another of his medical conditions from a testimony published in a few Ohio newspapers, theRepository; Summit County Beacon, and the Troy Daily News of 1883. He suffered from kidney weakness and liver problems for many years. His local druggist Mr. Latin suggested he buy a bottle of Hunt’s Remedy. After consuming 12 bottles Stake claimed that Hunt’s Remedy cured him of his illnesses. He died less than 2 and half years later on May 25, 1886. He was a steady customer with the Chapman Brothers from 1879-1886, and was a great haggler over prices. Sale #27. February 28, 1885, 189 lots. His later business collateral was plain white paper stock which he hand stamped with his oval business rubber stamp in purple ink. Fig. 5. Charles L. Stake business correspondence with the Chapman Brothers, Wesson TOB Duplex? postmarked December 21, 1885, 2 PM, Dayton, Ohio. His later business collateral was plain white paper stock which he hand stamped with his oval business rubber stamp in purple ink. The last auction known in which he was a bidder was held by the Chapman Brothers from April 6-9th, 1886, for A. Dohrmann, H. C. Brick, and J. F. Calder at Henckels, Philadelphia. He died 47 days after the sale. He is buried at the Woodland Cemetery and Arboretum, Dayton, Ohio. His grave has a granite trapezoidal column mounted atop three ascending plinth blocks and the name STAKE carved in the base. The column is capped with an ornate capital with a statute mounted on a plinth block of a standing draped female figure holding a trumpet. Numisma, Vol. 3, No. 2, March (1879); Vol. 3, No. 3, May (1879);Vol. 3, No. 4, July (1879);Vol. 3, No. 5, September (1879);Vol. 4, No. 6, November (1880) "duplicates for sale cheap"; Vol. 5, No. 1, January (1881); Vol. 5, No. 2, March (1881); Vol. 5, No. 3, May (1881); Vol. 5, No. 4, July (1881); Vol. 5, No. 5, September (1881); Vol. 5, No. 6, November (1881); Vol. 6, No. 1, January (1882). Martin Gengerke, American Numismatic Auctions. all editions.